Shore up your network security with the TL-ER6020 SafeStream Gigabit Dual-WAN VPN Router from TP-Link. Equipped with one Gigabit Ethernet WAN port, three Gigabit Ethernet WAN/LAN ports, and a Gigabit Ethernet LAN port, the TL-ER6020 SafeStream VPN router is capable of up to 940 Mb/s of NAT throughput and 99 Mb/s IPsec VPN throughput. 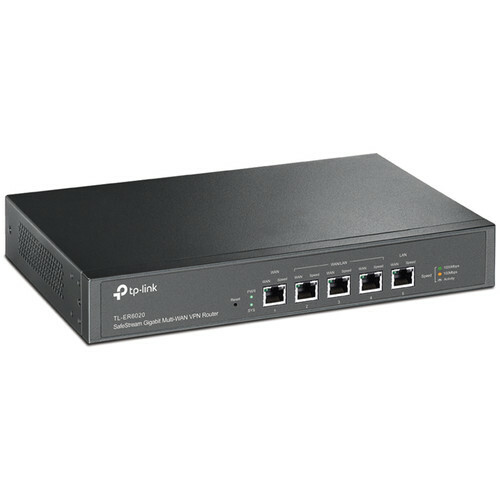 Ideal for small and medium businesses, hotels, and other venues with a large number of wireless users, the TL-ER6020 can handle up to 64 IPsec VPN tunnels using a hardware-based VPN engine, and it boasts support for IPsec, PPTP, and L2TP VPN protocols. Features such as load balancing, bandwidth control, and access control help to optimize network security and performance, while a captive portal makes it easy to authorize guest users. The TL-ER6020 supports passthrough traffic together with multiple VPN protocols, including IPsec, PPTP and L2TP in client/server mode. It also features a hardware VPN engine, allowing the router to support and manage up to 64 LAN-to-LAN/client-to-LAN IPsec VPN connections. Advanced VPN features include DES, 3DES, 128-bit AES, 192-bit AES, and 256-bit AES encryption, as well as MD5/SHA1 authentication and main/aggressive negotiation modes. With a 64-bit dual-core network processor, the TL-ER6020 is designed to handle multiple tasks while maintaining optimal performance. The TL-ER6020 features one WAN port and three WAN/LAN ports, allowing one device to meet multiple requirements. Intelligent load balancing distributes data streams according to the bandwidth proportion of each WAN port to make the most of multi-line broadband. IP-based bandwidth control and session limit functions give network administrators the power to flexibly manage how their bandwidth is used. Designed to withstand 4kV of electricity when well grounded, the router features professional-standard lightning protection that helps prevent electrical surges from penetrating your network equipment. Box Dimensions (LxWxH) 15.9 x 10.0 x 3.2"